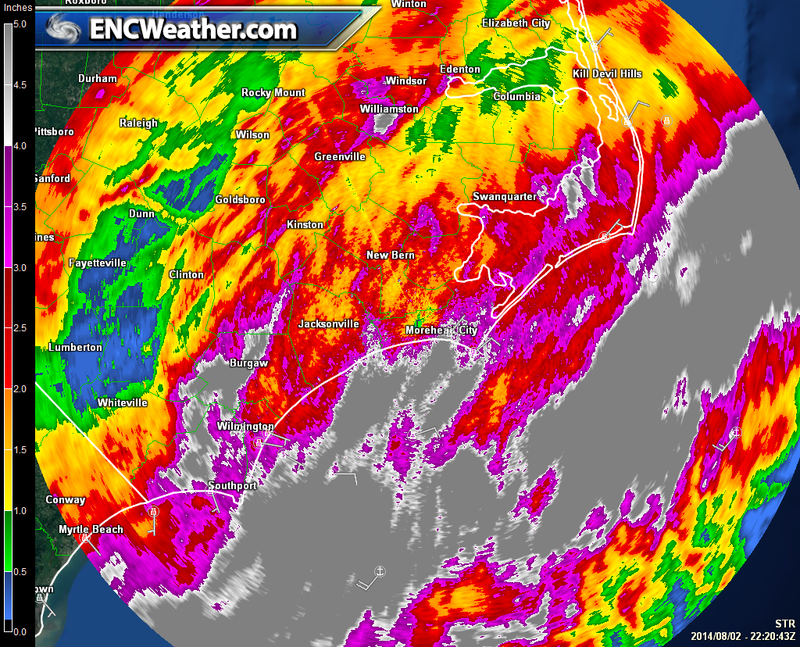 Storm total rainfall as of 6:30 PM EDT. Calculated by radar data. Heavy rainfall across the area has come and gone a few times and this pattern will continue throughout tonight. Locations receiving the most amount of rain are along the immediate coast from Myrtle Beach northward to just south of Kill Devil Hills. Another swath of heavy totals has also setup a line from Clinton to Edenton dropping an estimated 2+” today. That added on with the 2-4″ receive yesterday will begin to cause flooding situations across the east. Even more concerning is the forecast calls for another 3 days of heavy rain. More rain over the already over-saturated ground across the area will lead to small creek flooding, flash flooding, and river flooding as time goes on. Almost all of ENC is under a flood watch through Sunday evening. Here in Greenville, NC my location has received 4.50″ of rain (as of 6:30 PM EDT) for both Friday and Saturday. As the upper-level trough remains over the area, expect more rain to filter into the region over the next couple of days. Upper-level troughing still dominates the CONUS with a stationary front stretching across most of the eastern coast. Strong ridging resides to the east over the Atlantic Ocean aiding in the transport of moisture up along the surface front and into ENC. A series of shortwaves will continue to rotate through the trough increasing the chances of rain ahead of the shortwave. Areas across the east could see another 2-4″ of rain Sunday-Tuesday as very little movement occurs with the upper-level trough. The HRRR forecast model shows some early morning showers across ENC. The rain will continue into the day. I wish the forecast was that easy but I have to include another potential variable into the mix since it could have some impact over ENC. Over the past couple of days we have been following the life of Tropical Storm Bertha from a tropical wave to a tropical storm (I’ll still never understand why it’s classified as one). What ever is left of Bertha whether it is a tropical wave after it passes over the Islands or remains a tropical storm will continue to lift northwestward around the southwestern base of the ridge. It will begin to approach the upper-level trough over the eastern CONUS where it will ultimately be turned back northward around the western side of the ridge. Recent models indicate a potential for a low to develop off the Florida coast and track northeastward along the coast. Some runs have whatever is left of Bertha merging with that storms just off the coast of North and South Carolina. This solution would bring moisture onshore for the east potentially upping the forecast totals quite a bit. In this situation, this does not mean Bertha (tropical wave or storm) will make landfall along the coast. This will still occur hundreds of miles offshore and do not expect any adverse affects other than more rain from this solution. Potential surface low forecast to be near Charleston, SC Monday morning with Bertha northeast of The Bahamas. In the NAM forecast model solution, the surface low and Bertha could merge off the NC coast. This is just one of a few scenarios that could unfold over the next couple of days. In all scenarios, Bertha does not make landfall. The trough pushes eastward by mid-week bringing in more seasonal weather to ENC. Mostly sunny skies will persist with a slight chance for scattered showers and storms mainly along the coast. We will have to monitor the river levels during the week to see if any low lying flooding issues arise.